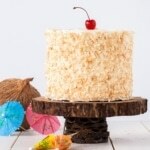 This moist and delicious coconut cake recipe is infused with natural coconut flavour throughout and decorated with giant toasted coconut flakes. Today’s post is a revamp of one of my oldest recipes. All the way back to 2015! It was one of those recipes that was good, but could have been better. My main issue with the original coconut cake recipe was that it used coconut extract. I don’t often like to use flavoured extracts in my baking, as I find them to taste artificial and generally unpleasant. Some are better than others, mind you, but I mostly stick to vanilla or try to infuse the flavours in some other way. Coconut extract, not unlike almond extract, is very easy to overdo. It’s strong, often overpowering, and can make your baked goods taste like you’re eating suntan lotion if you’re not careful. All of these ingredients (except for the coconut flakes) were super easy to find in the grocery store. For me, the first three were found in the Ethnic section, the rest in the baking section. The only thing that was harder to find was the large coconut flakes, which I picked up at Whole Foods. I didn’t end up using elements of the whole coconuts other than for the pics, but I was surprised at how easy they were to crack! How do you crack a coconut? One thing I should note is that if you’re cracking more than one coconut and want to keep the water, drain them into separate bowls. I didn’t know at the time, but the second coconut I cracked was a bit rotten on the inside, and I didn’t want to use the water after I saw that. For the actual cake recipe, I ended up using the canned coconut milk in place of regular milk, and I added medium shredded coconut to the batter. 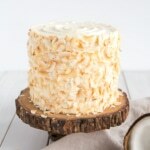 I would have preferred to use fine shredded coconut, because I don’t love the texture of coconut, but the stuff I had was unsweetened and I wanted to add a bit more sweetness to the cake. Either combination will work though — sweetened/unsweetened, fine/medium/coarse. It’s just a matter of preference! I didn’t end up using the coconut sugar in the final version of the recipe, because it colored the cake batter too much and I wanted a nice, white/yellow cake. So you can use coconut sugar and it will work totally fine, the cake will just have a slightly different flavour and color. But it’s important to note that coconut sugar doesn’t actually taste like coconut at all. It’s made from the sap of the flower buds of the coconut palms, not the coconut itself. It tastes and looks similar to brown sugar. The coconut milk powder worked extremely well in the frosting. 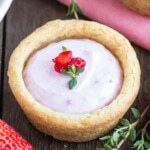 It added an amazing flavour without affecting the texture. If you were to use canned coconut milk instead, you’d have to use a lot more of it for the flavour to come through, and it could make the frosting too soft. I highly recommend using the milk powder if you can find it! I only used the the coconut milk powder in the frosting, not the cake, but I think it would be a great way to add more flavour! I’d probably add a couple of Tbsp to the dry ingredients. 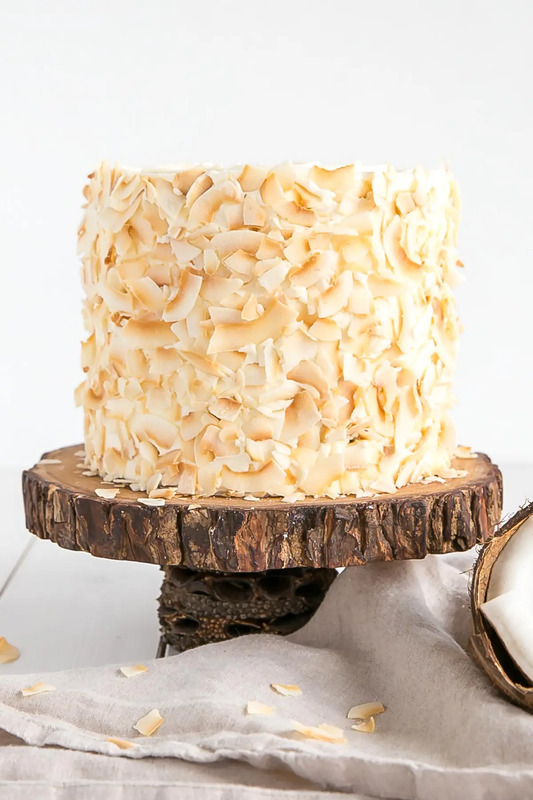 This pretty Coconut Cake is finished off with a simple decoration of some giant toasted coconut flakes, and I just love the look of them. I was able to buy mine already toasted, but I popped them into the oven for a bit more to enhance the color. How do you toast coconut? Toasting coconut is super easy and can be done in no time. Preheat your oven to 350F and spread the coconut in a thin, even layer on a large baking sheet. Pop it in the oven for 5mins, stir it around, and keep toasting until the desired color is reached. It’s important to note that it can go from beautiful golden brown to burnt very quickly, so watch it like a hawk and stir it around often. Make sure the coconut is cooled completely before using it on the cake. This Coconut Cake recipe has the perfect hit of coconut flavour throughout without being overpowering or tasting artificial. Any coconut fan in your life is sure to love it! Looking for more Tropical Desserts? Be sure to use canned coconut milk, not the stuff in the carton, and shake it well before use. Mine was quite smooth, but it can separate a bit, so be sure to shake it! I would have used very fine shredded coconut in the cake batter if I had it available, but you can use any kind you like. I used sweetened, but unsweetened will work too. The coconut milk powder worked extremely well in the frosting, adding great flavour without affecting the texture. If you like, you can add a couple of Tbsps of coconut milk powder into the dry ingredients in the cake batter to enhance the flavour even more. 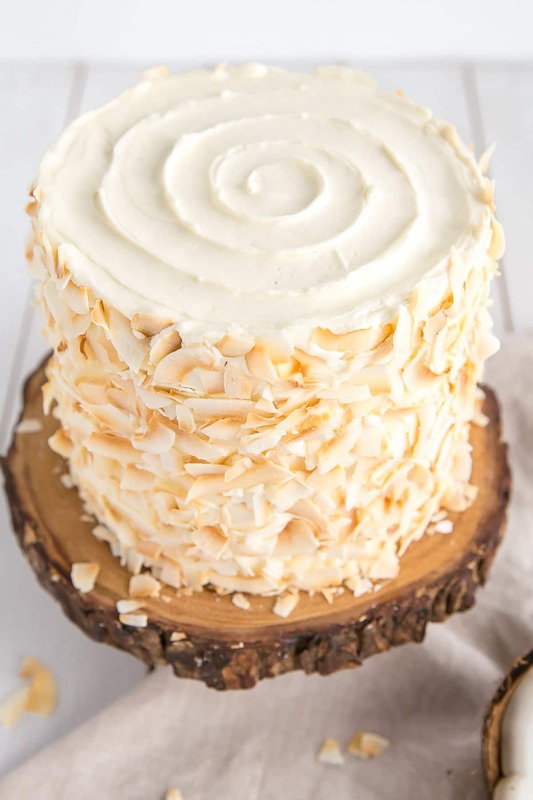 I love the large coconut flakes on the outside of this cake, but if you can’t find them you can use any kind of shredded coconut. This recipe, originally posted on March 1st, 2015, has been revised and updated. If you prefer to use an American buttercream, like my original coconut cake recipe used, you can use my Simple Vanilla Buttercream recipe and add coconut milk powder to it. 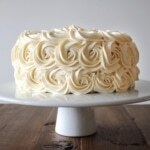 See my post on Simple Syrup for tips on how to make sure your cakes stay moist. This moist and delicious coconut cake recipe is infused with natural coconut flavour throughout. In a medium bowl, whisk flour, baking powder, and salt until well combined. Set aside. Alternate adding flour mixture and coconut milk, beginning and ending with flour (3 additions of flour and 2 of milk). Fully incorporating after each addition. Gently fold in shredded coconut. Bake for 35-40mins or until a toothpick inserted into the center comes out mostly clean. Place cakes on wire rack to cool for 10mins then turn out onto wire rack. Place bowl over a double boiler on the stove and whisk constantly until the mixture is hot and no longer grainy to the touch (approx. 3mins). Or registers 160F on a candy thermometer. Add coconut milk powder and whip until smooth. Place one layer of cake on a cake stand or serving plate. Top with approximately 2/3 cup of buttercream. Repeat with remaining layer and crumb coat the cake. Chill for 20mins. Frost the top and sides of the cake and smooth with a bench scraper. Do a swirl on the top. 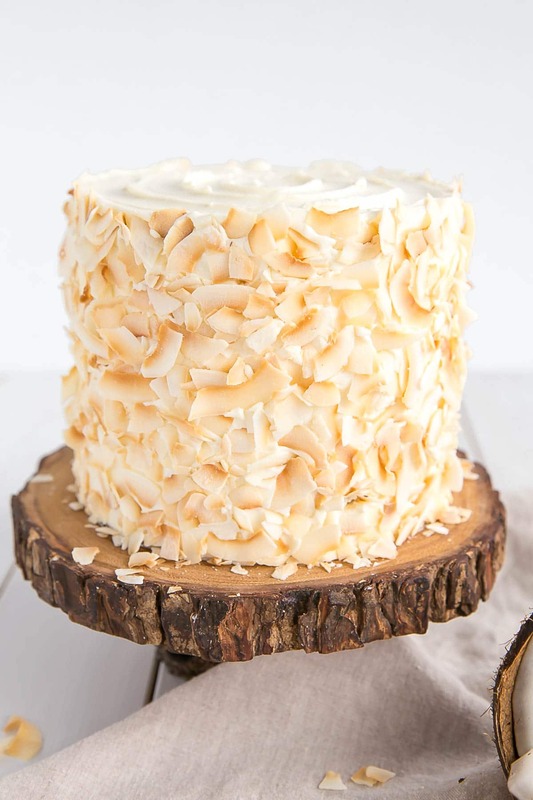 Gently press toasted coconut flakes into the sides of the cake. Hi Liv! I made this cake last year and it was a hit! I added a bit extra coconut milk powder in the batter. Making it again this year for my partners birthday. Only concern is that his birthday is friday but we are travelling so will have to make it a day in advance (on thursday). My thursday is very busy so I am wondering what your thoughts would be on making any steps in advance on the wednesday? would it still keep until the weekend? Hi Rachel! So glad to hear it was a hit — good call on the coconut milk powder! I think the cake would still be fine on the weekend, thougb maybe a bit drier. You can counteract that by using simple syrup on it when assembling. Otherwise you can make all of the components in advance and freeze them, then thaw and assemble. Do you still have the original recipe? I made it for my husband before and he loved it so I’d like to keep it the same! Hi Carrie! I’m sorry, I don’t, but I assure you this one is a million times better!! I’d like to modify this to be a lemon coconut cake. Was thinking I’d add some lemon zest to the frosting with the coconut milk powder, and 1-2 tsp of lemon extract with the vanilla in the cake batter. Any words of warning or advice? Hi Kate! I think that will work fine. I prefer to not use extracts so I would recommend lemon zest in the cake as well (creamed with the butter and sugar) and some lemon juice in place of the milk (maybe 1/4 cup). The extract will work fine though! Coconut Cake – What is the depth of your six inch cake pan? Hi Christine! Mine are 2″ tall, but 3″ will work too. Instead of using three 6″ pans, can I use two 9″ pans? The 9″ pans would be 2 inches deep as well. PS LOVE, LOVE, LOVE your recipes!! Hi Elizabeth! The recipe works for two 8″ pans, two 9″ would have very thin layers. I would 1.5x the recipe if using two 9″. Hello, I love all of your cake recipes! You always gave the perfect cake slices too. I have a question about the coconut milk powder, do you think/know how it will work when incorporated in a American Buttercream recipe? If so, can you please help by telling me how much or at what stage to add it? Hi Lois! Thanks so much! I think it would work perfectly fine with an ABC. I would add it at the end, after the sugar, but you might need to add more liquid (cream, milk) to get to the consistency you want. As for how much, it’s really just to taste. I would start with 1/4 cup and add more as needed. I just made this cake…oh my its a keeper! It is delicious!I love that the cake itself its not over sweet,just right,if a cake its not overly sweet its a good cake..i did not had round pans at hand and did not have all ingredients forthe meringue;but i have a bundt pan,it came out perfect!i just cooked about 10+min. Hi Leslie! So glad it worked out despite missing a few tools and ingredients! Hi Liv – This is the second recipe I’ve tried from your site and it is incredible! 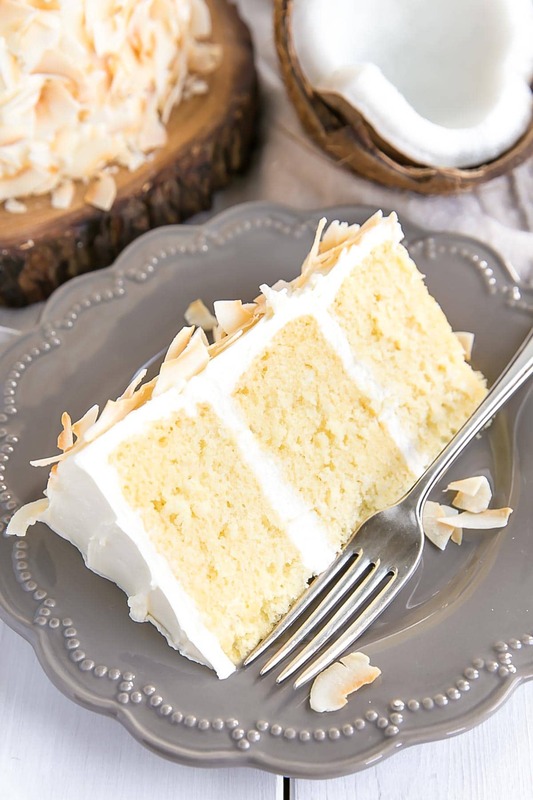 I used this recipe, but replaced the toasted coconut with shredded coconut for a winter “snow” look, and added shredded coconut between the layers. Everyone raved about it and devoured the cake in 10 minutes. Thank you! I had made a coconut cake for a friend of mine that I found online. It was my first coconut cake and I made it because it looked so beautiful. I wanted to taste that cake so bad but she wanted it for a party that she was having. I was trying to find that recipe to make that cake for Christmas when I came across your cake. It looks and sounds so delicious that I have decided to try yours instead. Thank you for sharing. Hi Leslie! I hope it lives up to your expectations. I love this recipe and the fact that the flavour comes through without the use of any extracts. Please let me know how you like it! I don’t know if the issue was that the Swiss meringue buttercream might have still been a little warm, but as soon as I started incorporating the coconut powder, the oil in it made the buttercream break 🙁 it still tastes fine, but it lost its smooth texture. Hi Shelby! That’s strange.. what do you mean by oil in the powder? It should not be oily. It sounds like it maybe just needed a bit more whipping though to come together again. 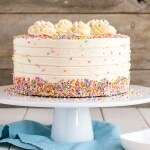 Do you think I could use this exact recipe and make 2, 8 inch cake layers? I don’t have 6 inch pans. Hi Bruce! Yes, it should work fine in two 8″ cake pans. hey olivia..not sure if you got my comment I posted yesterday… was wondering if i could replace shredded coconut with either fresh or dessicated coconut? also im planning to make a pirate ship for my sons birthday.. would it be easy to carve thi cake and would it hold well under a chocolate ganache? thank you so much for your amazing recipes! Hi Garima! I just replied to your other comment. Dessicated coconut and ganache will work just fine! i just made the chocolate cake and its absolutely delicious. also made the SMB first time ever and it was just so good ! thank you so much. I really want to make the coconut cake but the shredded coconut isnt available here. I can either use dessicated or fresh grated coconut. do you think it would be the same. 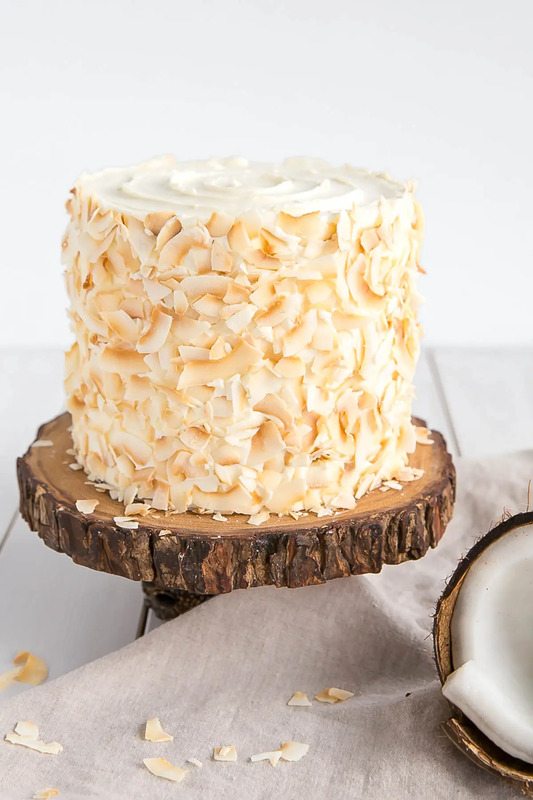 Also would it work in a layer cake.. Im planning to make a pirate ship for my boys birthday and he wants this coconut cake.. the ship would have to be brown , so I could either cover it with chocolate ganche or chocolate buttercream. what do you think? do let me know your thoughts on this..
Hi Garima! So happy to hear you liked the chocolate cake and SMBC! You should be able to use dessicated coconut just fine 🙂 And I think chocolate and coconut is a very popular combo so that should work well too! Thank you so much for taking time out to respond 🤗so excited to try this.. will keep you posted how it goes.. thanks again! Howdy. 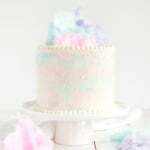 I really want to try this cake, but would like to make a single layer. Can I just divide the ingredients in 3? Hi Max! For sure, you can adjust the Servings slider down to 4 get the ratio for a one layer 6″ cake. Hi Liv , firstly want to say how much I love livforcake.com! 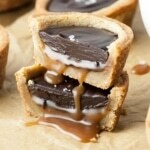 I have made a few of your recipes and have loved them all and found them such a pleasure to follow. I made this cake today and made my very first Swiss meringue butter cream. It was so easy and is soooooooo delicious. Can’t imagine making buttercream any other way now. I have a question in regards to the cake as I have made it twice now and it has sunk in the middle both times while it was still cooking in the oven. Could you assist with what I may be doing wrong ? Thank you for such beautiful recipes! – or are you at high elevation by chance? I also am on a high elevation. Thank you so much for replying. I will be more patient next time I make the cake and not have a cheeky 👀. Thanks again, any hints and tips are so welcome. I have to thank you! I made a GF version of this Coconut Cake and your Carrot Cake for my nieces birthdays today. They were AMAZING! Our entire family said that they were the best cakes ever and I would have to agree. I am so thankful to have found your website and I will be back for more of your wonderful recipes! 5 million stars! Hi Lily! I’m so happy to hear that the GF versions turned out well! You are so sweet, your comment totally made my day. Can’t wait to hear what you bake up next! Hi Tessa! Yes, it will work fine! Just reduce the baking time — start checking around 15mins or so. I doubled the recipe to make it into an 8″, three-layer cake. I used finely shredded coconut. Came out perfect! Hi Aya! I’m not totally sure… you could try replacing 1/2 cup of the flour with cocoa powder. does this cake freeze well once baked? Hi Alison! Yes, it freezes fine as long as it’s properly wrapped and stored. Hi Olivia, I would like to try this recipe. But I can’t find the coconut milk powder here. And I prefer to make the SMBC. So what should I do? Hi Mai! 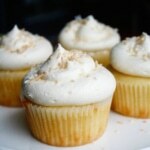 If you like, you can incorporate fine shredded coconut into the frosting instead. It won’t be completely smooth, but will give good flavour. You could also try to grind up some shredded coconut in a coffee grinder or food processor. I hope that helps! I found the coconut milk powder in the section of my grocery store where they have the powdered coffee creamers. Olivia! This cake is beautiful! I am making my daughter’s wedding cake and decorating it with large (untoasted) coconut flakes. I am wondering if I decorate the cake a day in advance if the coconut would dry out?? I won’t have time to do it the day of the wedding. Thanks for all your helpful tips on cake baking too! The cake will be 3 layers, 8,6, and 4 inch. There will be raspberry filling and almond frosting…and the coconut! Hi Donna! Thank you! I think it would be fine to do the day before — coconut is generally on the dry side anyhow. The raspberry and almond additions sound like heaven!! Email me a pic once it’s done, I’d love to see it! Hi Liv. Dee Rhodes (Feb., 2017) mentioned a cake with a translucent coconut frosting. I’ll bet she’s talking about an old fashioned recipe that my grandmother used to make. I am 65, so you can imagine how long ago that was! The cake is called a Japanese Fruit Cake, though it is neither a fruit cake nor Japanese. If you Google this name, you’ll find a million renditions. My grandmother used to grate fresh coconut for this cake, so it was “special occasional only.” My whole family doted on this yummy creation. If you ever decide to make this your own, I’m sure you will improve and modernize it into a masterpiece! Your coconut cake looks so beautiful. I am planning to bake it for my nieces’s baby shower. Thanks for the recipe. Hi Janet! Thank you so much for this info, I am super intrigued by that cake! I will google it to see what it’s all about. Your grandmother’s version sounds delicious. Hi Mary! Those are just the ingredients I experimented with. I didn’t end up using all of them in the final cake recipe. can you make and Frost this cake the day before or should you assemble the day of? I wasn’t sure if the toasted coconut on the outside would get soft. Hi Anna! That will be totally fine. It shouldn’t get soft! Hi olivia, i really love your recipes. The cake baked perfectly, but after cooling it and when I started leveling the cakes i found that it was still raw in the middle! This is the first time I experience this, especially that the cakes got a perfect golden brown color and no crumbs were seen on the wooden skewer.. any ideas about the reason?? Hi Nadine! Weird that there were no crumbs but the cake was raw! Hmm, did you bake them all at the same time? This is the second coconut cake recipe I have made, I liked the first one I made but I felt like there might be something better out there. This was soooooo yummy!!! Very light and buttery and super super moist which I am very picky about. This is a fantastic recipe and it is going into my recipe book as my new coconut cake. I paired it with vanilla buttercream. Thank you Liv! Hi Lillian! So happy to hear that you liked this one. I love how it turned out! Planning to make this tomorrow for a friend’s birthday. The directions say use. 3 six inch pans. Then later it says use 2/3 frosting and add second layer. Then in comments you respond that you kept it as a two layer cake. Please clarify. My friend loves coconut cake, so I want to get it right. Hi Christine! The frosting per layer is 2/3 cup, not 2/3 of the frosting. I recently updated this recipe from a really old one, which is why some of the comments didn’t make sense. I’ve deleted the old comments that no longer apply. Sorry for the confusion! The recipe will work for a three layer 6″ cake (as shown) or a two layer 8″ cake. What a gorgeous cake! I love all the research you did to get that pure coconut flavor. It looks incredibly delicious! 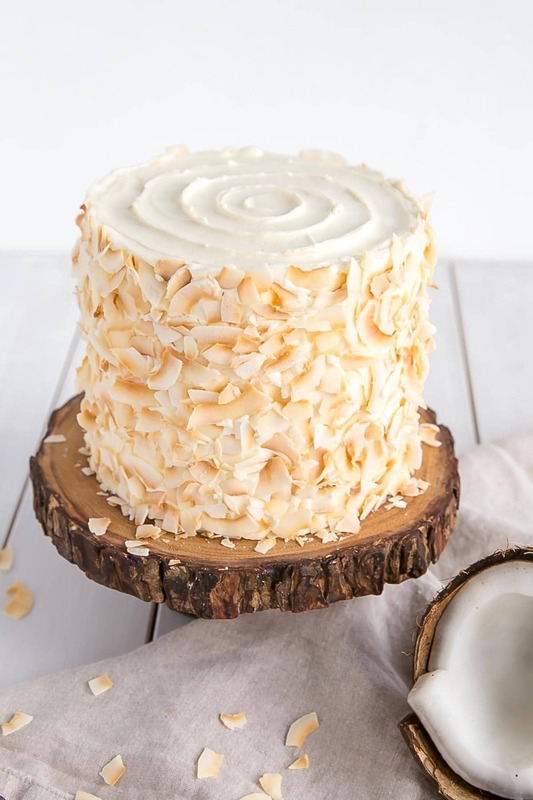 This looks like the ULTIMATE coconut cake, I have a family of coconut lovers so I’m going to make this for my daughter’s birthday! I will keep my eye out for you though! And you’ve given me an idea of something delicious to attempt :). And I am certain your cakes do not look like crap!! Cakes are not the easiest thing to attempt, so the fact that you’re doing them is amazing. You should send me some pics! Cake is gorgeous! Pinned to our Coconut Obsession board. This cake is beautiful… and your icing skills are incredible! Wish I had a slice now!